I discovered this memorial while on a "virtual tour" of Washington and thought it would make good one. There is a LOG PASSWORD for this cache (AABBBB). This cache was originally listed on TerraCaching.com. Based on the news of their impending shutdown, it will now be exclusively listed on OpenCaching US. Thanks to Gecko Dad for pointing a rather significant error with the original listing, that no other finder had pointed out AND for reminding me of it when I had not addressed it. It was a little too cold for catching today, but who has that ever kept from doing it? Thanks for showing me this monument. 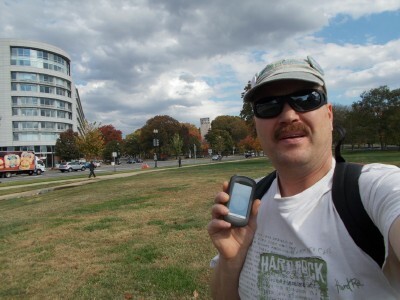 Well it was such a nice day and I had nothing planned so I decided to come to DC and grab a few caches. I ended up finding 6: 4 Terracaches and 2 Opencaching.us caches while logging 5.5 miles on the trek on foot. I had a little trouble with the CC. The inscription in the dark marble was almost impossible to see with my sunglasses on. Even with the sunglasses off and 3 feet from the inscription, it was still difficult to make out. After a capital tour I grabbed this one as well. Thanks Dudley Grunt for placing these caches. I enjoyed finding this relaxing spot. The metal plates in the nearby Constitution Ave. certainly do make a racket when cars drive over them. It's a shame to have to have so much security these days! TFTC. Since I found this cache when it was a terracache, not sure whether I want to claim it again as an OC. But it's an amazingly large monument almost completely hidden by surrounding trees.